Part 2 in a Multi Part Series. Never perform electrical work yourself unless you are a licensed electrician. Nothing in this article suggests that you should attempt to diagnose any electrical problems you may have or make any repairs yourself. Any attempt to make electrical repairs or upgrades can lead to your death. ALWAYS hire a licensed electrician to perform any electrical work. Electricity kills. Never perform electrical work yourself unless you are a licensed electrician. This article in the electrical series will cover the Branch Circuit Wiring. Branch Circuit Wiring includes the wiring FROM the circuit breaker box to your outlets, switches and appliances. What is the inspector looking for? 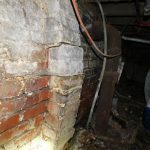 What have I found that can become an issue with a Home Inspection Report? Occasionally a home has a Sub Panel which is a second or smaller circuit breaker panel. There are many reasons for their use but for this article, I will deal only with the wiring to outlets, switches and appliances. Branch Circuit Wiring is the cabling in your home that distributes the electricity to outlets, switches for lights and other fixtures (e.g. a ceiling fan) and often times directly to an appliance like your furnace or Air Conditioner Compressor. As you may recall, electricity operates in a circuit and the electrons flow from the circuit breaker (or fuse) through the “hot” or “ungrounded” conductor to and through the appliance consuming the electricity and then it returns on (usually) the, “white” or “neutral” wire back to the circuit breaker panel. 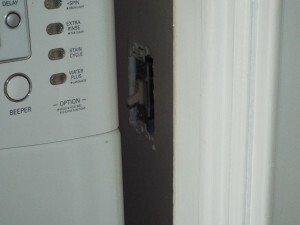 If that circuit is opened at any point the electrons stop flowing and the appliance will not work. 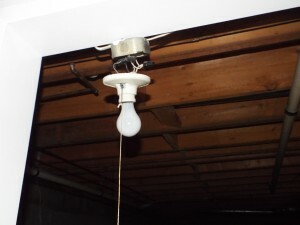 The “open” can simply be a result of a switch being shut off, a light bulb filament breaking, a plug being pulled out of a socket (all normal occurrences thus far) or a connection coming loose. This last one is not normal but nonetheless still stops the flow of the electrons. In your circuit breaker panel the hot wire is connected to a lug on a circuit breaker. This is usually the black wire and sometimes the red wire. The corresponding white wire is connected to a lug on the neutral bus bar. Please note that specialty circuits such as a Ground Fault Circuit Interrupts (covered in a later article) may be terminated differently. This description applies to 120V non GFCI. Over the years different types of branch circuit cabling and conductors have been used in homes. Let’s focus this discussion on modern homes and let’s define a modern home built from 1965 to present. So with that in mind the two main types of conductors used are copper (predominant) and for a period of the mid 1960s to the early 1970s aluminum was used. Around this time a third, ground conductor was also commonplace as was the three-prong outlet that we are familiar with. The three prongs are hot, neutral and ground. Both types of conductors were insulated (early on the ground conductor was left bare) and then the conductors were wrapped in a jacket. Metal or Armor jacketing is common and often referred to as, “BX”. Non metal wrapped jackets are very common as well and commonly referred to as, “romex”. The gauge or thickness of the individual conductors is very important because the type of metal and the thickness of the conductor (among a few other things) determines the electrical carrying capacity of the wires and therefore cables. This capacity is measured in Amps or Amperes and for typical branch circuit wiring varies from 14 gauge copper for a 15 amp circuit breaker to 12 gauge copper for a 20 amp circuit breaker. These are very typical for the vast majority of household circuits and appliances. However when we consider appliances like pools, hot tubs, air conditioning compressors, electric furnaces, electric clothes dryers and other large appliances, 12 and 14 gauge wire is inadequate. This too is a topic for another article. Suffice it to say that the smaller the gauge the larger the diameter of the conductor and these large appliances may require 10, 8, 6 or lower gauge and hence, thicker wire. As an inspector I see some pretty awful wiring and would like to share a few examples. If you see things like this in your house it would be wise to call Regal Home Inspections for a thorough inspection and it would be prudent to call a licensed electrician afterward to correct the problems before you try to sell the house. Here are some examples of poor residential electrical wiring. Do you think this was installed by a Licensed Electrician? 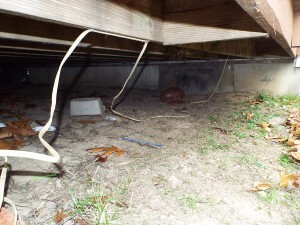 Photo 1 is under a deck. This is “romex” type cabling. Can’t verify that it’s designed and approved for outdoor use. Use of a rigid conduit is appropriate. Not only is this highlighted in an Inspection Report but it will also raise concern that the work was not done by a professional, with a legitimate permit in place and I can assure you that it wasn’t inspected. An inspector should alert the client that this would have never been done by a qualified, licensed electrician. As a result this will be a clue that work has occurred in this house that may not be legitimate. By this I mean that there may be electrical work that was likely not done with a permit and inspection. 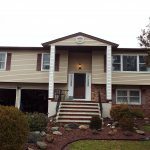 Consequently there may be other aspects of the house, like plumbing, structural changes, etc. that may have been done by the homeowner. Not necessarily the person you are buying from but perhaps someone that they bought from and the last inspector didn’t find for whatever reason. 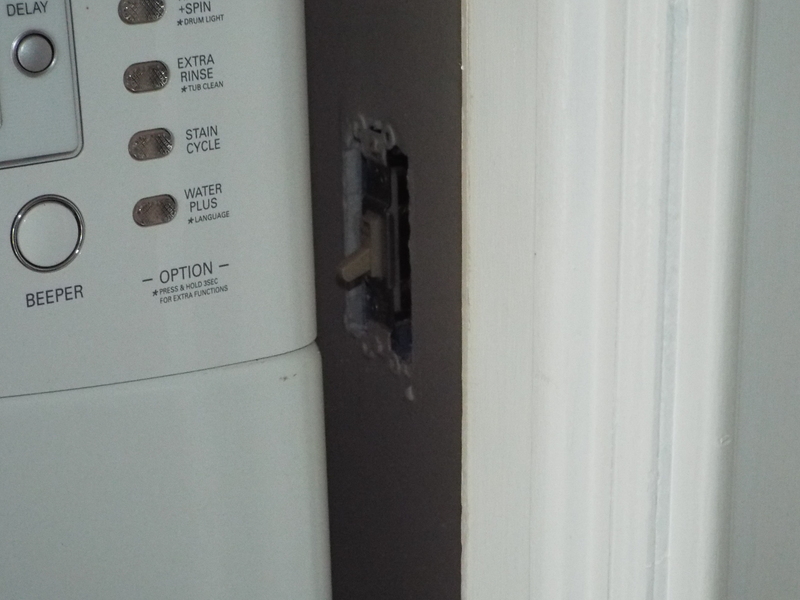 Poorly maintained outlets also seem to be very commonplace in homes that I have inspected. Photos 2, 3 and 4 are examples of outlets and a junction box that should be covered and secure. Some should be completely removed. If you look carefully you can see an outlet without its cover in Photo 2. The issues with Photo 3 include no cover to the junction box, no cover to the outlet, the receptacle isn’t grounded (as indicated by the green test probe) and it should be a GFCI outlet. GFCI outlets are required in unfinished basements. 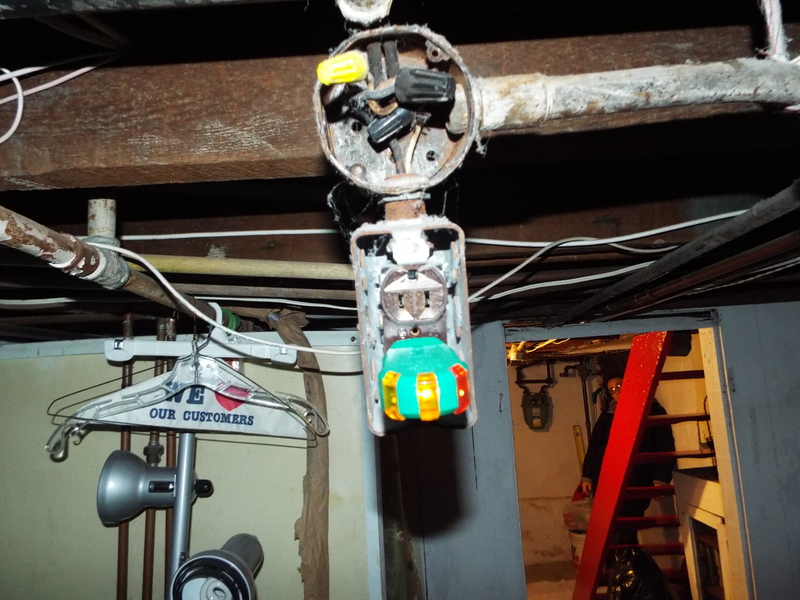 GFCI outlets have been required in unfinished basements since 1990. 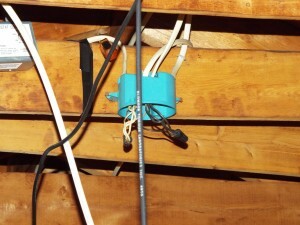 In Photo 4 is a junction box with wires hanging down. 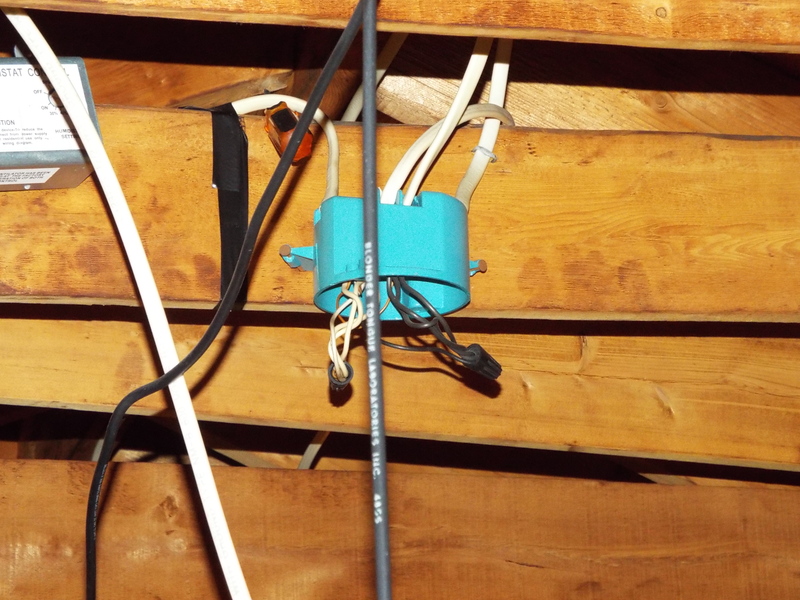 The uncovered junction box is located in an attic space. 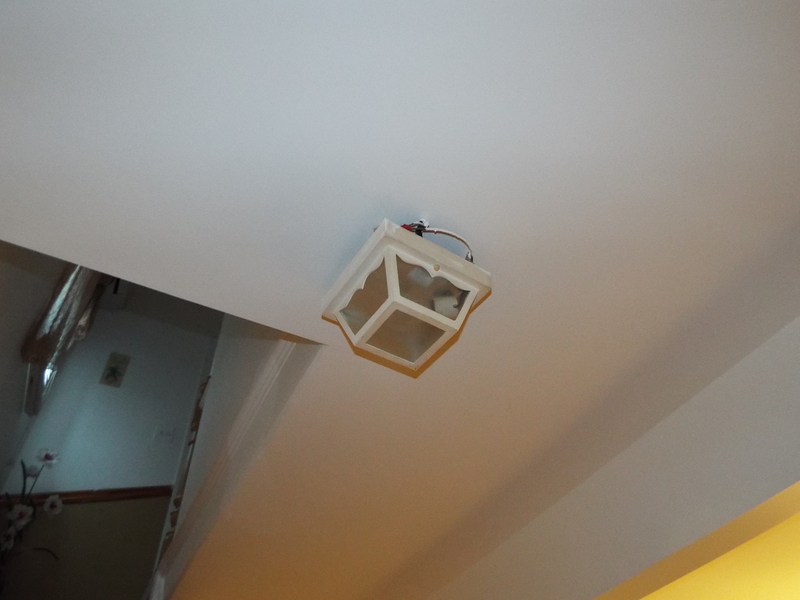 I come across numerous light fixtures that aren’t mounted properly and have exposed wires. Here are a couple of examples in Photos 5 and 6. Please note that in Photo 5, a globe should cover the exposed bulb. Although this fixture was in a crawl space I have seen many fixtures like this in closets, stairwells and basements. These are just a few examples of electrical issues I have found in homes. When inspecting a home I try to identify every electrical problem that I see. As soon as I have identified one, single electrical problem the standard template words include, “consult a licensed electrician” to help/correct/evaluate, etc. Most inspectors will stop there as soon as they find the first electrical problem. In an effort to help the client I try to identify as many issues as I can find in my report. In this manner the client can either have the issues properly priced and ask the seller to fix them or they can evaluate the cost and perhaps ask the seller for some price concession. If the seller isn’t willing or able to pay for obvious corrections, in the case of a bank owned short sale for example, at least the client has a thorough list of the issues and can share that with an electrician and get a more accurate estimate of the repairs. If I find 10 problems with the electrical system, for example, it’s probable that a licensed electrician will find a few more. My findings are not intended to be an exhaustive list nor a list of work items that is required to fulfill the requirements of an electrical work permit but it will give the client an idea of the extent of the work; Minor, extensive or major repairs necessary.